KUNA — Kevin Gifford, the principal at Reed Elementary School, could be at home enjoying his summer off. Instead, he serves homemade root beer in 100-degree weather on the playground. “I’m showing up to express how important it is to get a book out,” Gifford said. Nearly 150 students of all ages have shown up to Reed Elementary on Thursdays this summer to participate in ‘A Book and a Bite’ — a program focused on summer reading. Students receive a free lunch, select a book to take home and engage in educational activities. Treasure Valley Education Partnership (TVEP) is piloting the program. Last year, TVEP reviewed data to identity elementary schools experiencing summer slide — which occurs when students lose some of the achievement gains they made during the school year. TVEP selected an elementary school in Kuna and another in Emmett. “When this opportunity came to our school I was thrilled because this is a community hub,” Gifford said. Research shows if a child reads five or more books over the course of the summer, it can help alleviate the two months of learning loss that students often experience. The program is based on three elements — free books from United Way, volunteer-led read aloud sessions and an educational activity provided by nonprofit partners. 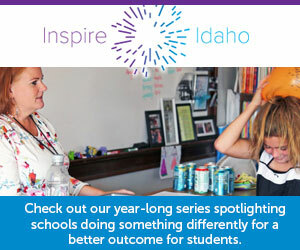 TVEP is utilizing the Idaho Commission for Libraries’ reading curriculum. The program’s goal is to keep students at the same level they left the school year with. TVEP plans to look at Idaho Reading Indicator scores in Kuna and Emmett in the fall to see if the program had an impact on students. “When we look at the data we will figure out what we need to change about the program,” Ruehrwein said. A ‘Book and a Bite’ is located at the Oasis Worship Center’s Feeding site in Emmett City Park on Wednesdays and at Reed Elementary School in Kuna on Thursdays from 11:30 a.m. to 1 p.m. at both sites. Anyone is welcome to join.